Recorded at Grace Cathedral in San Francisco, the second installment of Frisell's Download Series presents the guitarist at his most intimate...and most vulnerable. By 2007, Frisell had honed his ability to self-accompany with looping to such a sophisticated extent that it's hard to believe there's only one guitarist delivering a subtle but attention-grabbing version of Curtis Mayfield's classic, "A Change is Gonna Come." Frisell's remarkable patience allows the song's form to evolve slowly, almost inevitably, with his warm toneâ€”expanded by plenty of reverbâ€”making even the moments where he is playing without loops rich and room-filling, even at low volumes. 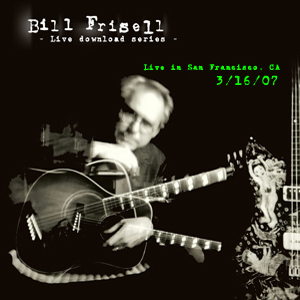 Since Frisell released the award-winning Nashvilleâ€”an album that drew no small line in the sand for the guitarist, as he seemed to desert the more angular direction of his previous albums in favor of eminently lyrical and structurally simplified Americana (there is, however, often far more to his seemingly simple music than meets the eye). Frisell comes under fire, periodically, for "deserting jazz," even though it would have been impossible to record an album like Nashville without the broader vernacular he'd developed from his earliest days, with saxophonist Jan Garbarek and bassist Arild Andersen. He continues to pay tribute to personal favorites, like pianist Thelonious Monk , on albums like Bill Frisell, Ron Carter, Paul Motian, and here he delivers a solo version of "Crepuscule With Nellie" that's homage in its wry edge, but all Frisell in its chocolaty-rich warmth. There are no loops here; just Frisell with no shortage of reverb to fatten up the sound, managing a remarkable feat of self-accompaniment, largely through implication. Frisell similarly turns Monk's "Evidence" into a surprising mÃ©lange of dense voicings and languid single-note phrases, later in the set.